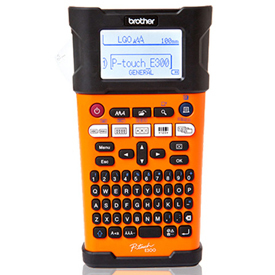 Brother PT-E300 - Designed by industry professionals for industry professionals, the PT-E300 is the first of a new generation of the P-touch EDGE family of industrial handheld labeling tools, created to help inspire labeling. Brother started from the drawing board so the PT-E300 is built right the first time for the contractor or IT professional. Brother paid close attention to details and developed smart and intuitive features that will help the PT-E300 conform to work flow processes for virtually any size job.